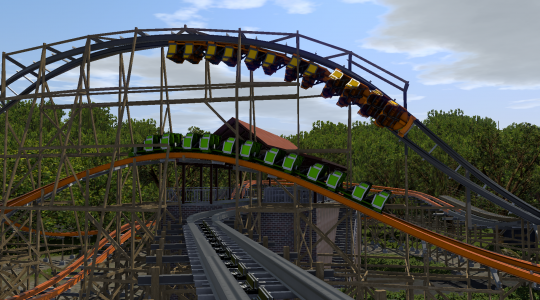 Congratulations to ctg614's Twisted Tiger - RMC Gwazi , the latest winner of RCTgo's Build It Competiton! Twisted Tiger - RMC Gwazi beat the other three entries with 15 votes and 50% of the vote. Download Twisted Tiger - RMC Gwazi now! Congrats, although in the future I would like to see far more effort put into scenery work around your NL2 rides. I know you guys have what it takes to make some great stuff in the game! I mean we don't even know if twisted tiger is even going to be an RMC redo of Gwazi. The possibility is there but to be honest we just don't know. Busch Gardens Tampa hasn't made any official announcements and until we see work being done on Gwazi we shouldn't just assume that this new trademark is for an RMC. Its a high possibility but we can't assume anything. Anna to put it bluntly it doesn't matter that its not real or if it ever will be, what matters is that it was a well done creation and used the existing layout of Gwazi well. Could have used a little more scenery but the real ride didn't have much for scenery either. Congratulations on a well deserved win. Oh no I agree that it was well done and I voted for it. The turn off for me was the name simply because we just don't know weather or not the name "Twisted Tiger" is referring to an RMC redo of "Gwazi" but I also can't shake the feeling that Gwazi is two coasters and not just one. I don't know everything about this entry was intreiquing that's for sure. I mean yeah BGT filed a trademark for something called "twisted tiger" but it's a huge mystery. Its called a prediction. We all make them. I guess its a very good prediction then. I DO like RMC coasters too real or fictional RMCs are amazing! I am way too late again but good win! Would echo what Chris said.